BMW has been on a roll and it is grabbing headlines again by unleashing the refreshed version of 7 Series in the market. This is just the type of vehicle that you can expect to set the market abuzz, with the most intense engineering coming together in one piece. It is well known that this legendary car maker has got a firm grounding in the Western hemisphere, with places like Europe and the US teeming with luxury car buyers who have deep pockets. However, the company is still establishing its scene here in India, and we know that vehicles such as these are exactly what bring the company to a firm footing. With major overhaul done to the saloon, BMW will now take on the likes of Mercedes Benz and Audi in India. 1. A significantly improved product over its predecessor. 2. Pricing is reasonable, compared to its nearest rivals. 1. Interior design still remains the same. 2. Luxury quotient is improved, but not up to the levels of S Class. 1. The interiors are packed with cutting-edge features and state-of-the-art equipments. This sixth generation 7 Series is the best BMW ever. 2. Innovative features like BMW Gesture control function and Sky Lounge could make way for a new Trend in automobile industry. BMW has a tradition to push boundaries and come up with new technology that revolutionizes the automobile industry to a greater extent. 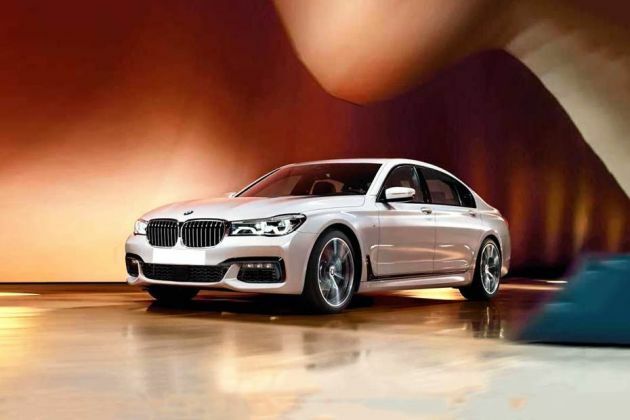 Although, the 7 Series saloon is not the one with benchmark in luxury, its innovative technology and features are the ones that define its exclusivity. It entered into its sixth generation in 2015, but it wasn't until 2016 Delhi Auto Expo for its arrival here in India. The overall variant line-up has been retained along with some of the features and equipments as well. The BMW 730Ld Design Pure Excellence CBU is one of those variant, which is available as a completely built-in-unit. With stunning exteriors and staggering performance and improved comforts, this vehicle offers sheer driving experience unlike any other. This 7 Series saloon has a typical BMW design DNA that announces its presence on roads. On front, we have a broad kidney grille with chrome struts that reflects the sporty look. It is surrounded with delightfully trimmed LED headlight cluster on both sides. LED lights package comes with adaptive function, 4 DRLs, cornering lights and direction indicator. What draws your attention is the masculine hood with crease lines and stunning BMW badge on the center. Classic side profile too has character lines, which passes throughout the length. Much of the design remains the same like its predecessor, save for the moldings paced beneath doors. Its fenders have been mated with a set of 19 inch light alloy wheels with tubeless tyres embracing them. Moving to the rear, it gets redesigned taillight cluster with LED lighting. The rear bumper has a masculine design like the front one and it is decorated with a chrome strip. Overall, this latest version has drastically improved over its earlier model. Subtle changes have been made to the interiors with improvements to the quality of materials, cosmetics and color scheme. First, we should talk about the ambient lighting system that offers mood lightning in six different light schemes. While the cockpit looks trendy as usual with veneers, attractive design elements and equipments. It houses a 10.25” touchscreen infotainment system with integrated touch command and other functions. It is also integrated with BMW apps, navigation system with 3D maps. The instrument cluster has a dual-pod design and it features a speedometer, tachometer and other necessary functions and warnings related to the vehicle. Rear seat occupants can get access to the world of entertainment with individual 9 inch screens, which feature a Blu-Ray drive and other necessary connectivity ports for external devices. One of the foremost features is the BMW gesture control that enables driver to access the infotainment system with simple gestures. Some of the other features incorporated inside the car include comfort electric rear seats with massage function, gentleman function for front row passenger seat Panorama glass roof with sky lounge. BMW cars are known for their top notch performance and efficiency and this variant is no exception. It is powered by a 3.0 liter BMW Twin-power Turbo inline Diesel engine under the hood. It is a 6 cylinder mill featuring 24 valves and makes a total displacement capacity of 2993cc. It can churn out power of 265 bhp at 4000 rpm combined with 620 Nm torque between 1500-2500 rpm. The machine can accelerate 0-100 kmph mark in mere 6.2 seconds and can attain a top speed of 250 kmph. It is also good with respect to the fuel efficiency, as it can deliver a mileage of 16.77 kmpl mileage. Its transmission duties are handled by an 8 speed steptronic sport automatic transmission. This sixth-gen 7-series gets a significant improvement to its ride quality and dynamics that makes handling simpler. It sits on an adaptive 2-axle air suspension system that is usually used for high end luxury cars. This is one of the reasons for its sheer luxury and comforts on-board. This machine also comes with dynamic damper control unit with infinite and independent damping technology that makes for a comfortable drive. BMW driving experience control with Eco Pro coasting lets you choose one of six driving modes. These mode changes influences the performances of various components of the car and offers a desired driving style. It comes along with cruise control system with braking function that makes for a stress-free driving experience. BMW has never compromised on the safety standards of any of its models. This CBU version gets a slew of sophisticated safety features including airbags (dual front) accompanied by head airbags (front & rear) and side airbags which safeguard the occupants. Its front passenger airbag comes with a deactivation facility. ABS with brake assist and dynamic braking lights enhances the safety quotient. There are few other safety features like dynamic traction controls, cornering brake control, Electric Park braking with auto hold function, engine immobilizer with early crash sensors, seat belt warnings, side impact protection, ISOFIX child seats door locks, all this and more put together make this one of the safest machines out there. The all new 6th-gen 7 Series is a perfect example of what BMW can do in the automobile world. It is luxurious, power packed performer and exceptional with regards to handling traits. Its diesel engine on the other hand is the heart of this car. Despite several improvements, it still lacks the sheer luxury offered by Mercedes S Class or a Jaguar XF. However, it is a car with innovative technology and style all under a very competitive price tag making it one of the most capable machines available today.